The dual hose portable air conditioners work more efficiently and are portable. They can be moved from one room or office to another. These air conditioners may consume more energy when compared to the single hose air conditioners and may cost a little bit more. But, they work efficiently in large rooms and provide cooling faster and safer. 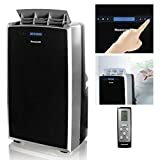 Here are 5 best Dual Hose Portable Air Conditioners for 2019. This product is another type of the Whynter 14,000 product, with its main highlight the 3M Antimicrobial high air flow (HAF). This air conditioning unit is almost the same as the Whynter 14,000 dual hose air conditioner (ARC-14S). 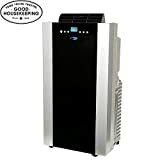 The Whynter 14,000 BTU Dual Hose Portable Air Conditioner (ARC 143MX) is another stunning product from Whynter. It comes with an anti-microbial air filter, this filter uses an anti-microbial agent to stop the growth of mold and mildew. This filter is micro-structured and uses electrically charged traps to catch particles such as hair and pet dander. This unit is wired with an auto-restart function, this means, the product will resume with the previous settings on it in case of a power outage. It can cover a space of up to 500sq. ft. The dual hose fixed to the cooling unit aids its cooling process faster. It features an auto-drain technology, this technology recycles moisture to produce cool air. This product was designed for commercial use in mind, it can be used in usually hot environments. It is mostly used in data centers and server rooms because of the heat produced by the processors. It does not require any special maintenance to keep it running flawlessly. This cooling unit uses eco-friendly materials to keep you cool, it uses a non-ozone depleting refrigerant (R410a.). It uses a relatively low power with only 1250 watts of power being used to keep it running. It uses an upper and lowers direct drain option, this helps to reduce excess condensate accumulation. This air conditioner is another product of the Whynter BTU brand. This air conditioning unit also maintains the eco-friendly history of Whynter products. This air conditioner has many features which makes it an important product to own. This product, like most Whynter products, use an advanced technology known as self-evaporating technology. This technology recycles the moisture collected during the cooling process to produce cool air while reducing condensation. The air conditioning unit can be set in any of the three modes as needed (dehumidifier, fan mode, and air conditioning). You may set it in the air conditioning mode if you need cool to remove hot air and get more cool air, the fan mode works on the same principle as a fan and the dehumidifying mode which removes humid air from the room and improving the overall quality of air. You don’t have to worry about safety when using this product. It comes with a timer which can be set to any time you want the air cooling unit to automatically switch off. It also has an auto start function embedded in the hardware. This makes it possible to restart with the previous settings before a power outage. This product comes with a carbon air filter. The filter helps to remove carbon from air produced giving safe oxygen. It also comes with a remote control, which affords you the luxury of sitting on the couch and controlling the air around you. Honeywell is another brand name in air conditioning. This particular product features a dehumidifier and rooms. The brand is popular for its high energy air conditioners. They can cover rooms of up to 700 sq. Ft. This product comes in two colors, black or silver. The Honeywell MM14CCS Portable Air Conditioner is built with durability and efficiency in mind. This product features a washable filtration system, which helps to filtrate carbon from the air being produced. This air conditioning unit comes with a thermal overload protection on the compressor and motor, this helps to reduce pressure and reduce the fear of overheating. This cooling unit uses a dual motor technology, using this technology reduces the noise levels significantly. This product has a “quiet” operation, at the highest performance level, this unit produces 51-54 decibels of sound. It also comes with a remote control and a touchscreen panel for easy control, the remote control saves you the stress of going to the panel every single time. The filtration system does not only filter dusts, it has a double advantage of filtering dust and carbon. This filtration system also filters hair and pet dander at the air entrance unit. There is no doubt Honeywell has done a good job with the filtration system. It helps to reduce impurities in the air while not making it a cumbersome task to wash the filter. The Honeywell MM14CCS Portable Air Conditioner is so easy to set, in fact, all the accessories of this air cooling unit have been optimized for easy installation. It can be easily moved from one room to another as needed if you cannot afford more than one. This cooling unit has a low energy consumption when compared to other units of its capacity. It also comes in three modes which include the air conditioner mode, fan mode, and dehumidifying mode. The air conditioning unit can be set in any of the three modes as needed, you may set it in the air conditioning mode if you need cool to remove hot air and get more cool air, the fan mode works on the same principle as a fan and the dehumidifying mode which removes humid air from the room and improving the overall quality of air. This air conditioning unit is another variant of the Whynter ARC, BTU brand. This product comes with the bonus of a heater and a storage bag. This air conditioning unit maintains the eco-friendly history of Whynter products. The Whynter ARC-14SH 14,000 BTU Dual Hose Portable Air Conditioner was built with eco-safety in mind. This product is highly efficient and uses lead and CFC free materials. It uses the GREEN R-104A refrigerant which is CFC free and eco-friendly. It also uses self-evaporating technology otherwise known as auto drain technology. This technology recycles the moisture collected during the cooling process to produce cool air. This product comes with carbon air filter, this filter helps to remove carbon from air produced giving safe oxygen. It also comes with a remote control, which affords you the luxury of sitting on the couch and controlling the air around you. It has a moderate noise level and is highly portable, weighing just 80 pounds, it can also be kept safe in its storage bag. This is definitely the best or arguably one of the best dual hose air conditioners you can find in the market. This product comes in two colors which are black and platinum. The brand name “Whynter” is a well-respected and a household name in the air conditioning world. This air conditioner has immense capacities and features which makes it a must-have product. This product uses an advanced technology known as self-evaporating technology. This type of technology recycles the moisture collected during the cooling process to produce cool air while reducing condensation. You don’t have to worry about safety when using this product, it comes with a timer which can be set to any time you want the air cooling unit to automatically switch off. It also has an auto start function embedded in it, this makes it possible to restart with the previous settings before a power outage. 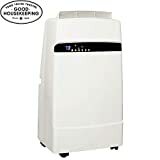 One of the many features of this air conditioning unit is the dehumidifying mode, this unit can be set in this mode to reduce the humidity of the room it is being used. 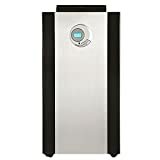 You don’t have to worry about carbon waste with this product, as it comes with a carbon air filter which helps to improve the quality of air produced. This air conditioner is designed to be portable, powerful, and surprisingly easy to set up. This air conditioning unit can proffer solutions to the unavoidable hot areas in your home or office, areas such as the server room or kitchen. No doubt, dual hose portable air conditioners provide more efficient cooling service than most other types of air conditioners. Buying air conditioners, in general, requires great knowledge. A good air conditioner must be efficient with the cooling process, be portable and have easy to use controls. Make sure the cooling unit you go for uses an eco-friendly refrigerant. Go for cooling units with a dual hose, these aids the cooling process and increases efficiency. Go for a portable cooling unit, you may need to move it to a different room if the need arises. Portability is a plus for any cooling unit and portable cooling units have taken over from the rigid window sized ones. You can opt for the newer window units. It allows natural air to steam in from the surrounding and blowing hot air outside at the same time. This can unit can come in handy for users with hypersensitivity issues. Dual hose air conditioners can be used both residentially and commercially. Single hose portable air conditioners can only cover a little space while dual hose portable air conditioners can cover both large and small spaces efficiently. It is advisable to opt for dual hose air conditioners because the pressure is lower when compared to the single hose air conditioners. If you have a lot of heat generating heat appliances or a room with a high roof or ceilings, a dual hose portable cooling unit is the best option. They work efficiently in areas with high temperature and have high heat dissipation. Look out for remotes and control on the cooling unit. Opt for a cooling unit with remote and easy to use control fixed on the cooling unit. This makes it easy to control the speed and mode from a distance. A good air conditioner must have at least three modes to afford you the luxury of flexibility. The three modes may be air cooling, fan or serve as a dehumidifier. Go for eco-friendly cooling units. We all want to make the earth a better place to live in right? It is advisable to opt for cooling units with eco-friendly and non-ozone depleting refrigerants. This can go a long way in preventing global warming. No one likes to be disturbed by noise, you should look out for the noise generated by the cooling unit. Many people complain of great noise generated by cooling when set to either low or high, so noise is an important factor to consider when buying an air conditioner. Take your time to look for cooling units that consume less energy while serving the basic functions on an air conditioner. This tip is useful for buyers with a lean pocket and for buyers who don’t want to spend extra on their electricity bill. Make sure the filter fixed on your cooling unit is easily accessible and can be cleaned with ease because you must clean your filter often to keep it in good shape for the filtration purpose. It is not a bad thing to get some assurance for your money, go for air conditioners that come with at least one year warranty. A good air conditioner can be able to act as a coolant and a dehumidifier. A good cooling unit must be able to produce cool air and also remove excess water from the air. Fully evaporating air conditioners: Most of the top brand cooling units features an evaporative model in which all the water condensed during the cooling process are not disposed but fully recycled to produce more cool air. Partial evaporating air conditioners: In partially evaporating cooling units, water is evaporated and condensed but no fully condensed as there are still a few drops of water left to be disposed of. Dual hose portable air conditioners can make a great acquisition when you go for the right product. They can help to improve the air condition of your home, office or workshop. A good air conditioner must have some features which make it stand out among other products. Most cooling units come with eco-friendly refrigerants. It ensures that the brand has the safety of customers in mind.